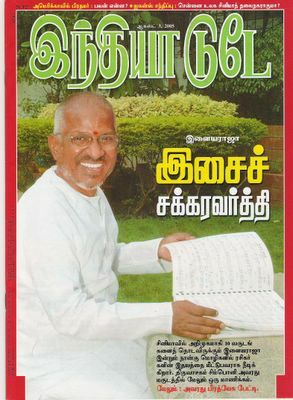 The August 3,2005 tamil edition of India today features an Interview with Maestro Illayaraja and also traces his journey from " Annakili to Thiruvasagam" . I haven't read the issue yet but I understand its a must grab for Raja fans. Havent listened to the Symphony yet. Do you know if this is on the internet somewhere? i also saw this in Li'l india....but didn't buy it. do read it and let us know about the contents. Very interesting to note that this issue of India Today has published an interview with Ilaiyaraaja. Has anyone read it? I presume it is in Tamil (which I can't read). If anyone has read it, would you mind inserting any information that may be valuable or relevant to the Wikipedia article on Ilaiyaraaja (or perhaps substantiate statements made in this article by referencing this India Today interview to it)? I thank you kindly if you could help in any way.